I’ve never met a group of trainers who care about their clients as much as the coaches at Trooper Fitness do. With a deep understanding of human motivation, Head Trooper Prince Brathwaite creates a warm and welcoming environment where traditional boundaries don’t exist. Men do modified push-ups, women lift heavy weights and no matter what, individuals put their very best foot forward in whatever fitness challenges they can handle. That’s all Prince asks for. By creating a high-energy atmosphere full of motivational tips and phrases, Prince inspires his clients to achieve both physical and mental toughness as he puts them through rigorous workouts that don’t quit. 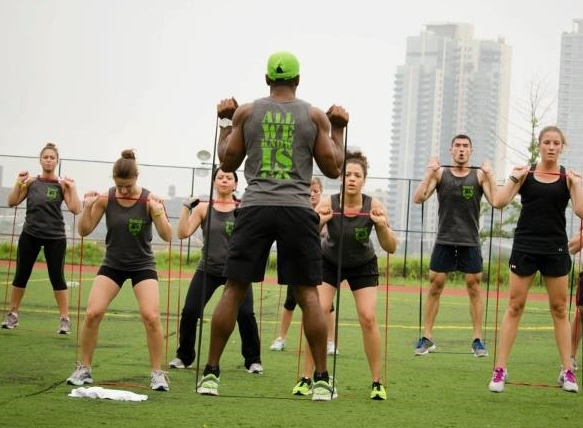 The workouts Trooper Prince designed for Booya Fitness are no different. Clocking in at just under 30 minutes, Prince will have you drenched with sweat after dynamic and plyometric circuits. That’s why we’ve curated hard-hitting hip hop soundtracks to accompany each video: You’ll definitely be digging deep for these workouts. Trooper Bodyweight Conditioning: Use just your body weight in this high intensity interval training session to challenge your cardiovascular system and rev up your metabolism. Turn it Up: Resistance Band Challenge: Use resistance bands, dumbbells or just your own body weight to tailor this session to your workout level. This entry was posted in Fitness Tips and tagged cardio, strength, trooper fitness on April 19, 2015 by TeamBooya.